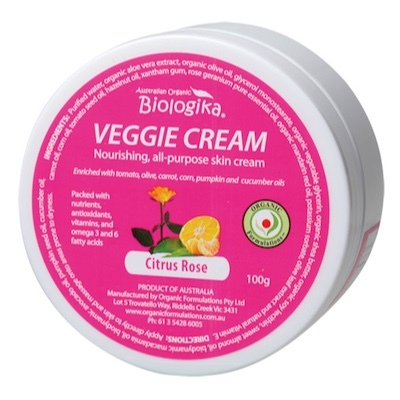 Biologika Veggie Creams are a unique blend of natural and organic vegetable oils to nourish the skin. They are packed with nutrients, antioxidants, vitamins, omega 3 and 6 fatty acids. Biologika Veggie Creams are a nourishing all-purpose skin cream with a rich and silky feel to protect skin from the extreme of any weather. Enriched with tomato, olive, carrot, corn, pumpkin and cucumber oils they are safe to use all over the body, even on the most sensitive of skins. Purified Water, organic aloe vera extract, organic olive oil, glycerol monostearate, organic vegetable glycerin, organic shea butter, organic soy lecithin, sweet almond oil, biodynamic macadamia oil, biodynamic avocado oil, pumpkin seed oil, cucumber oil, carrot oil, corn oil, tomato seed oil, hazelnut oil, xantham gum, rose geranium pure essential oil, organic mandarin red oil, potassium sorbate, olive leaf extract and natural vitamin E.